Good 3D user interfaces are difficult to design and build. They may be also difficult to evaluate properly. Unless your implementation is very good you risk the possibility of measuring results that are due to particular issues of the implementation rather then technique limitations. Since building them takes a long time and effort, it would be good if we could predict how a specific technique would fare before investing too much time in the implementation. In usability engineering we can use different levels of prototype fidelity to communicate ideas and evaluate concepts before a full-fledge prototype is built. They can range from simple textual descriptions and sketches to fake interfaces and wizard of oz approaches. If we are evaluating interaction techniques and in particular 3D user interfaces the lack of fidelity in the prototypes make it difficult to trust any evaluation result. However we must agree that at least *some* characteristics exists and can be evaluated without experiencing the actual real interface. During this semester I have researched the literature trying to find methods that could be used to evaluate early stage low fidelity prototypes of 3D user interfaces. Most of the methods of evaluation of 3DUI involve mixed methods and at least a empirical evaluation (either formal or informal). Usability guidelines are useful but most were created as aid in the exploration of the design space, rather than in evaluation. Doug A. Bowman, Ernst Kruijff, Joseph J. LaViola, and Ivan Poupyrev. 2004. 3D User Interfaces: Theory and Practice. 1-Metaphor use: The system should be based on a known metaphor so that the user can leverage his understanding of the real world to operate. 2-Gesture design: The gestures should be easy to perform and support the user by using constraints and limited degrees of freedom. 3-Gesture feedback: The interface should respond to every gesture and the interface should provide means to guide the execution and understand the results of the actions . 4-Visual design: The visual layout should support the metaphor and fulfill the user’s expectation in terms of meaning and consistency. After spending some time thinking on how to use Myo for text input and experimenting a little bit we think we can share some of our findings. Myo does have some strengths when compared to other input devices. 1- It is minimally intrusive and can be used for mobile interaction. 2- It can sense hand poses. 3- It has IMU with accelerometers and gyros to detect arm movement. 2- It seems to be sensitive to the initial calibration. 3- Hand poses can be stressful and difficult to change between them (this is required for proper detection). 4- Many false negatives (generally for the less stressful poses). 1-Live mic problem - hand poses can be activated by accident, though rarely. 2-Lack of spatial frame of reference. 1-Restrict the set of hand poses used frequently to the ones that offer less false negatives (wave-in and wave-out). 2-Use the initial set of recognized hand poses as primitives to obtain a larger set ( add gesture and gyroscope data). 3-Allow for continuation of gestures. Since most gestures are stressful, allow to user to specify parameters by continuing the motion. 4-Try to use relative hand positions instead of using absolute space positions. 5-Try to transition between gestures that are easy to perform (some gestures are hard to transition e.g. between fist an open hand). We hope that these ideas are useful to others designing interaction techniques using Myo. On a previous blog entry I mentioned that Myo could be an interesting device for bare hand text input. After being able to play with it for a while I can offer my first impressions. The armband seems pretty well designed. It has no hard edges and the material feels good to touch. It is somewhat bulky and even though it is not heavy on the arm, the aesthetics might be more appealing to men. It also comes with small clips that you can use to tighten the band if you have thin arms. There are no buttons, just a USB connector for charging and a glowing logo in one of the pods. Every time you put the armband you need to perform a special sync gesture. It is used to detect the arm and the orientation it is being worn. If for some reason it slips from the original position, you will need to calibrate again. This is not common though. After a successful calibration Myo will acknowledge by vibrating. It also vibrates when it is removed. This haptic feedback works very well and makes straightforward to start using without even looking at your display. The SDK recognizes five different hand poses: palm pointing left, right, spread fingers, fist and thumb to pinky. These poses can be combined with data from the IMU to create more complex patterns and detect movement. The API gives access to the pose detected, orientation data and the vibration motor. As we inferred the poses are fairly independent from the arm orientation, which allows more flexibility for design. The quality of the built in classifier is also good for a first version. We noticed some false negatives and false positives with the former being more common. Sometimes you need to repeat the same gesture several times before it gets acknowledged. In our limited experience the pinky to thumb seems the most difficult to recognize, which also correlates with the fact of it is the less stressful pose. Left and right hand poses are the most reliable, they are almost flawless. People seems to hold different opinions regarding which pose is the most tiresome, but in general all of them seems less fatiguing than we initially thought. In retrospect the engineers at Thalmic made a good choice in selecting the poses and the decision of shipping with only five of them was also wise. However, as a researcher I wish I could have access to more data. This would allow me to play with new algorithms or just select poses that make more sense for my particular task. I hope they change it on the future like Leap Motion did. It does not need to provide all EMG data, just the "tension" values for each group of muscles would suffice: palm, thumb, fingers. I do not believe they have constructed their classifier in this way but I think it can be done. This seems a good tradeoff between flexibility, simplicity and battery life. As we spend more time with the armband we might need to adapt our original ideas for text input. If the gesture pinky-to-thumb end up being unreliable we might be tempted to remove it altogether from our design. The information from the IMU, on the other hand, may open more interesting directions for our work. We experimented with the rotation of the arm (roll), for example, and it seems pretty stable. Summing up, even with the current limitations Myo it is a very interesting device. It is ready for some new cool interaction propositions. Anyone ? Swype is a commercial text input system developed originaly by Swype Inc. an latter acquired by Nuance Communications. It was first presented at the TechCrunch50 in 2008. After that several similar keyboards appeared for smartphones. To enter a word in swype, the user draws a continuous line over the characters without lifting the finger from the screen. The software uses an algorithm to determine the word that is more closely related to the input pattern. Since there is no need to be precise and since you do not need to take your finger from the surface for each letter, you can type very fast. In fact, in 2010 a Swype employee gained a entry into the Guinness World Record for the fastest text message on a touchscreen mobile phone. The technique used in Swype is similar to the one presented five years early, on the CHI 2003 conference and later in UIST 2004. In the paper Shorthand writing on the stylus keyboard, Zhai and Kristensson present SHARK, a technique that contains most of the benefits we see in Swype today. In SHARK each word is also defined by a pattern drawn over a keyboard layout. In this work, however, the authors used the ATOMIK keyboard instead of a QWERTY. The ATOMIK was designed to minimized the gesture time between keys that are more frequently used. The authors argue that gesture input for words can be better than tapping letters if you are able design them in a way that require less visual precision. This explains why even though you require more travel time, it is still fast to input text with this technique. The authors, however, were targeting the use of the gestures as a shortcut for most used words. The ideia is that after training a user would be able to input words without using the keyboard as a guide. They created an alphabet for the most frequent 100 words. Words that were not on this group used normal tapping input. In SHARK words are recognized using dynamic programming to compare the distance between the gesture and a template. The most similar word is returned. If only the direction and shape of the gestures are considered then some ambiguity still remain. The authors proposed that the initial or center position of the gesture could be used to solve this problem. In SHARK2 they improve upon the previous system by adding visual trace to the gestures (similar to what Swype does) and by assuring that every word could by entered by the same method. This more advanced system combined information from shape and location classifiers as well as a language model to increase the discrimination power. The inclusion of visual guided input works very well as an scaffolding technique. Even after using Swype for while, I don't think I was ever able to draw a word from memory alone. Wearable devices will change the way we use and experience technology. Many challenges still need to be solved such as better integration with clothing, better battery lifetime and many questions regarding interaction. These devices can have very small displays or even no display at all. When this happens, common techniques such as keyboards and touch screens are not so useful anymore. Google glass in a prescription frame. Today many wearables rely on a smartphone companion for internet connection and some advanced tasks, however many understand that decoupling from mobile devices is a necessary step to achieve the vision of a truly omnipresent and invisible technology. Connectivity is already on the way in devices like the Samsung S, which uses a mini-sim for direct 3G access. A good interaction technique would impact a lot the use of these devices. Apple has recognized that we need to come up with different ideas so it recently proposed using the watch crown as an interaction device. The main problem is that we usually want to increase the expressiveness of input not to narrow it. For this reason along the years we have supplemented keyboards with mouses, tablets and touch screens. By making smaller devices we inadvertently tend to scale down the interaction possibilities too. Two exceptions to this are voice and gestural input: since they are not physically attached to the input target they can maintain their power regardless of the device size. Voice recognition, unfortunately, has some obvious disadvantages if you are in a noise environment or don't want to bother nearby fellows. Together with Ayshwarya, I have been studying the possibility of developing a gesture-based text input technique as part of our work for a Natural User Interface class at Virginia Tech. We decided to go along a selection technique for letters instead of drawing/handwriting. We believe that selection has the potential of being much faster since you can create methods to choose a letter in constant time. In fact, with a few exceptions, most of the current input systems go in this way. Another trend is to use some kind of prediction or correction algorithm to minimize mistakes and effort during input. Touch based techniques implicitly highlight letters, since the user can tell from his hand position and ﻿tactile perception﻿ when no letter has been selected. Other input devices, however, may require an explicit designed disambiguation mechanism (such as a button) or use a technique that combines both highlighting and selection. Joysticks are a good example of the first group. They generally use a specific button to selected a highlighted item. On the other hand, Swype unifies the two actions: the drawing of the curve is used determine probable letters and then words. Another classic technique that combines highlighting and selection is the Dasher. 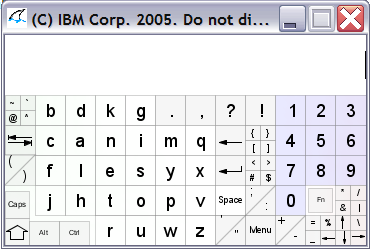 In this technique the user continuously steer a cursor, which run over letters selecting them. Finally, the purpose of the last action is to enable the user to prematurely end the word input, based on suggestions from an autocomplete system. Regarding the input device, our first idea was to use Myo. This would theoretically allow users to input information using gestures and hand poses without the support of a desktop or computer, something more close to the wearable ideal. 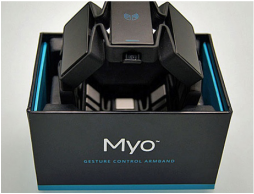 Myo works by analyzing signals captured from your arms in a process called electromyography. The signals are processed by a classifier that can distinguish 5 different hand poses. The armband also contains an IMU (gyroscope, accelerometer and magnetometer) that can be used to track the relative position to the ground and the acceleration of the arm. Next steps involve generating some options for input mapping and some way of evaluating them. Lets talk more about text input. What is common between the existing methods? This classification is far from being complete and definitive. Some techniques can combine more than one input method or can be considered borderline. For example, you can activate virtual keys by using gestures, your eye, touchscreens or hand poses. However this classification is enough to provide a start point for analysis. Keyboards are good for several reasons: you can use your 10 fingers, have a clear confirmation when the letter has been input and can use your muscle memory to type without looking at the keyboard. Drawing techniques such as Graffiti are good because they can leverage your knowledge of writing and the letter shapes to memorize a large number of commands easily. Virtual keyboards use the fact that they are not real to improve input by changing the way you activate the keys. Finally voice recognition use the association of phonemes and written text to allow you to input text. Ideally we would want something that is fast to learn and use. Something as intuitive as drawing a letter and as accurate and fast as the keyboard. When we consider the application in virtual environments, where the user does not have a physical keyboard, further restrictions apply. Many interesting ideas are ruled out from the beginning because they simply add more complexity to an existing input system. If you are selecting a letter, anything more than just pointing at it will not present a real gain. The only exception would be just looking at it instead of pointing with a device or your hand. If we want a method that is easy to learn we are pretty stuck with using a common known letter layout (qwerty or alphabetically), speech or drawing. Even with the advent of the GUI, touchscreen and voice recognition, the basic mechanism for text input remained mostly unchanged for more than 100 years. The keyboard and the QWERTY layout are still the most widely used method and still the fastest one. The qwerty layout was developed in 1868 to be used int railroad ticket typewriting. After that many changes were made in the layout to try to improve the speed, the most famous being the DVORAK. Anyway typing is quite fast. The world record is 216 words per minute, achieved on an electrical typewriter in 1968. The average typists is able to achieve 40 words per minute. Check the infographic and measure your own speed. Mobile devices, have reduced space to house a full keyboard and virtual ones also lack haptic feedback. This makes typing more challenging. To cope with this restrictions, most mobile keyboards utilize some kind of input prediction to correct words half typed or mistyped. 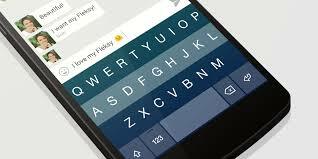 This is an on going competition with several contenders such as swype, flesky, swiftkey and so on. The great majority, however, are still variations of the original QWERTY keyboard. The qwerty layout on a mechanical typewriter. When thinking about text input in immersive environments the situation gets further complicated. Besides the lack of haptic feedback for keys there is also a loss of the reference frame. If you want to keep your hands away from a solid surface you eventually move away from the keyboard or cannot keep stroking at the same positions. I believe that a good text input method will be necessary to increase the range of applications using gestures and VR. Researchers have come up with a lot different ideas for more natural or efficient text input in theses conditions. However, none seems to have been established as a good solution for now, which is unfortunate. Watching computer appearances in movies is always interesting. It is fun to imagine if computer technology would really work in the way presented by Hollywood. Sometimes they manage to get computer scientists very puzzled though. Click at the image on the side to read three plausible explanations to a question whose answer has eluded many for years (Courtesy Wolf Gnards). When done right, however, movies with futuristic elements are a great opportunity to see new ideas and concepts from very skilled designers. Besides incredible motion graphics, most Sci-FI movies routinely present some kind of advanced display or interface. One recurrent ideia is the combination of holograms and 3d interaction with gestures. You can see it in several movies such as Tron, Iron Man and my favorite, District 9. Iron Man 2 interface and holograms example from Bo Opfer on Vimeo. DISTRICT 9 // Image Engine from Goldtooth Creative on Vimeo. Feelings of power and mastery - Characters on movies are generally heroes that are either technology experts or possesses and control some incredible technology. These impressions are usually conveyed by complex interfaces, wireframes and by the acting itself. Immersion and Flow - Users expect to be immersed in the world or the activity being executed. If the interface detracts from the goal experience it will not be effective. They expect the interaction to be fun and rewarding. These are nice guidelines but perhaps they are too general to help us with the specific goal of building better gestural interfaces. As a user you always want to be in control, not the opposite. It is also complex to require both immersion and flow. Not all applications provide immersion and flow is hardly a property of the interface alone. 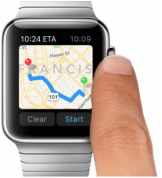 These actions are almost a 1:1 mapping to real world gestures. So they tend to feel more intuitive and even advanced (on the sense that they understand what you mean). This set some guidelines on what users may expect from those gestures. The most interesting point by Noessels is really about the role of language in interfaces, but I will discuss it later. If you are interested, NoteLoop has an interesting blog with a section dedicated to Movie UI. Last year I wrote about how the Samsung's move into the smartwatch arena could be fruitful, despite the lack o appeal and technical issues with the first Galaxy Gear. Today it has officially announced its sixth smartwatch model: the Galaxy Gear S. As Engadget has pointed out, in the last 12 months the company has launched the impressive number of 5 iterations/versions of the Gear. Until now the strategy seems to be working. Samsung has been responsible for 34% of the global smartwatch sales in 2013, followed by the Peeble (NPD). This latest version seems very promising. A large screen, 3G connectivity, GPS, curved display, heart rate monitor and even a qwerty keyboard. In fact I think that it is quite cool. Relying on the same OS (Tizen) it inherits the app ecosystem from the previous generation of watches. Battery life is supposed to stay in the same range of previous ones: 2 days with similar processing power. Sony has also announced its SmartWatch 3. Even though the hardware specs seem better than the Gear S, the design just feel uninteresting. Moto 360 feels much better in this respect. Update: Moto 360 has launched with a round backlit LCD, Texas Instruments OMAP 3 processor and inductive recharging dock. However, its biggest selling point is the beautiful design. The LCD circular display and stainless steel body makes the watch elegant and sophisticated. Even though the 360 has its charm, it think that being able to stay way from google, the better connectivity options and longer battery live, would make the Gear S my choice.